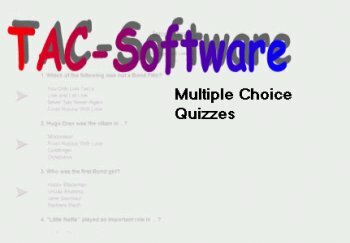 Multiple Choice Quiz Maker is an authoring kit to produce tests and quizzes for the inter- or intranet. To create your test, fill in the appropriate question and answer fields. To see how it looks in HTML, click on the View Quiz button and your rendered Web page will be displayed. There is immediate feedback on the correctness of an answer for the test-takers and, if required, a message with the quiz results can be forwarded directly to your e-mail address.